ETL listed for safety rating in the US & Canada. This Vent VP-33 air mover is the only air mover that we carry, that is ETL listed. This is huge for industrial settings where everything in the facility needs to be listed. Don't be fooled by competitor's that list just the motor as being ETL listed, this is an ETL certified product! The Vent VP-33 air mover actually has the C-ETL-US approval, which means it is safety certified for sale in the United States, Canada, and several other countries. This is one of our snail style carpet dryers that has 2 speeds and 3 different blowing positions. It is fully stackable for those with limited storage availability. 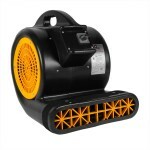 The daisy chain feature on this unit makes it unique compared to other snail style air movers. Most of those pull so many amps, you can't plug multiple units into each other. You can safely plug 3 units into each other with this system, because each unit only pulls 2.9 amps on its highest setting. For more ETL listed products to round out your restoration or cleaning inventory, please take a look at our Dri-Eaz LGR 2800i dehumidifier, and our ETL certified air filtration device & scrubber. C-ETL-US listed for use in facilities where the ETL listing is imperative for safety standards. Powerful 2-speed 2530 CFM air mover dries wet areas in record time. Daisy chain capable with a G.F.C.I. outlet for flood restoration drying. 3 different positions of blowing air: horizontal, 45 degrees, and 90 degrees. Handle designed for balanced carrying and stackability for storage. Low amperage draw allows you to daisy chain 3 air movers together without having to worry about blowing breakers. This is a review for the ETL Listed Air Mover.